Excel Database and Cloud data updating (Devart) is an Excel add-in that can connect to range of database services and cloud based applications. Flexible query building allows to extract live data from databases and cloud services for automated reporting purposes. Changes and additions can be made directly in Excel and saved back for updating the data source in real time. Work with live data in Excel from various sources and modify for easy updating. External cloud applications supported include Salesforce, Microsoft Dynamics, Zoho CRM and SugarCRM. External database formats supported include Oracle, Microsoft SQL Server, MySQL, PostgreSQL, SQLite and DB2. The user interface provides the ability to select tables, object and columns with filtering or use SQL syntax for complex querying. Data can be refreshed automatically on a set time interval or manually for instance reporting updates. Data can be modified with inserting new rows, updating existing values and deleting records within Excel and then updating the source database or application in one execution command. 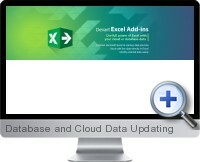 Excel database and cloud updating is supported in Excel 2007 and higher.